Experience remote hill country trekking, ascend Adam's Peak and discover the natural wonders of Uda Walawe National Park. Our feeling is that the ethos of your business is remarkably genuine, and you have attracted like-minded people to help you. Thank you very much! A unique holiday and better than anyone else could offer in Sri Lanka! Sri Lanka is such a beautiful and welcoming country, it has such a variety of places to visit from cool tea plantations, stunning beaches, fascinating temples, mountains, a plethora of wildlife and some excellent hotels. And did I mention the food? It is almost worth going there for that alone! Having just returned from the country I cannot recommend it highly enough. Few treks in Sri Lanka offer the chance to ‘trek’ in the traditional sense, and we are very pleased to have designed an itinerary that does. Our trek starts in Bandarawela, a typical hill country town, small and bustling, and takes us through a mixture of virgin forest, tea plantations, small settlements and endless valleys. We take in the mountains, cloud forest, and rich biodiversity of Horton Plains National Park and we stay at simple tea bungalows, plus spend a night in a genuine Buddhist temple. Descending south from the hills we see a very different side to Sri Lanka, the plains are in the ‘dry zone’ but covered in dense, impenetrable jungle. Here we experience the wilds of Uda Walawe National Park, a sanctuary for wild animals displaced by the construction of the Uda Walawe Dam. The park is well-known for its herds of elephants, wild buffalo, deer and leopards. Finally we head to Sri Lanka’s stunning coast for some time to relax by the sea. Meal arrangements: 12 Breakfasts, 11 Lunches, 12 Dinners. Fly from London to Colombo. Transfer to Ratnapura. Drive to Bandarawela. Afternoon village walk. Trek to temple and overnight there. Trek to roadhead and drive to Dickoya. Early morning ascent of Adam's Peak. Return to Dickoya, remainder of day at leisure. Visit Uda Walawe National Park for a game drive and to see the elephants. Transfer to the coast. Time at leisure. Your Sri Lankan guide will have an in-depth knowledge about the culture, history, flora and fauna of this beautiful island which they will be very happy to share with you. By nature they will extend a warm welcome to their country and they will also speak good English. For the trekking portion, you will be joined by an experienced trekking guide. Day 1 - Fly London to Colombo. Depart London by overnight flight for Colombo. Day 2 - Arrive Colombo. Group transfer to Ratnapura - 2-3 hours. You will be met at the airport by your vehicle and transferred to your hotel. It is a couple of hours drive towards the bustling town of Ratnapura. Ratnapura means 'City of Gems', and it is to here that Sri Lankans flock to buy small plots of land to mine in the hope that they too will discover precious stones. Set outside the town, the hotel is in a peaceful, rural location and is a great spot to relax after the flight. Day 3 - Drive to Bandarawela - 3 hours. Village walk in the afternoon - 2-3 hours. Today you continue your drive through the verdant foothills to Bandarawela, the starting point of the trek. Lunch will be at the atmospheric Bandarawela Hotel, where you will meet your trekking guide before a ten minute drive that takes you to the start of your two/three hour afternoon walk back to the hotel. This is a chance to stretch your legs, and view at first hand a small farming community. Ingenious use is made of every scrap of flat land. You will walk through village fields, rice paddys, and past village houses. Your guide will help identify the local flora and fauna - this area is a haven for birds. In the early evening it is well worth walking around Bandarawela, which is a typical, bustling hill town. Day 4 - Trek to Haputale - 5-6 hours. This is the start of your trek, and you will walk gradually uphill to reach a ridge overlooking the town. The walking is on a mixture of small tracks and paths, and before very long you will start to experience the wonderful views across the jagged hills. Lunch will be a picnic before descending to your accommodation for the night. Day 5 - Trek to Ohiya - 5 hours. The walk today starts through the manicured tea plantations typical of this region. The views are stunning, and after passing through the small town of Haputale, you climb gradually (after passing the colonial mansion of Adisham) to reach a fine ridgetop. Within a short distance you enter original highland pine forest - full of birds and bear monkeys, - with signs of wild bear, eucalyptus forest and grassy hillsides. A feature of this part of Sri Lanka is the incredible railway, and the track gradually rises to meet your path. Sri Lankans use the railway track as a path, and you will join them along the next half mile. After a picnic lunch, today's walk is completed through tea plantations with fabulous views south to the plains. Day 6 - Horton Plains circular walk - 5-6 hours. Today you will enjoy a circular walk that encompasses the main views and incredibly rich biodiversity of Horton Plains National Park, an area of mountain moorland and cloud forest. From the park visitor centre a broad track leads you onto the plains and via locations with such evocative names as 'Chimney Pool' or 'Leg of the Mutton pool' to reach Baker's Falls. Although not especially high at 20m/65ft Baker's Falls is a picture postcard spot, where the rushing waters of the Belihul River plunge into a gorge filled with rhododendrons. You can view the falls first from an observation deck and then after a short climb down, from their base. Your next viewpoint will be the dramatically named World's End, where the plateau drops away in a vertical drop of some 1,000m/3,300ft to the plains below. The paths around the plains vary from broad tracks to narrow dirt paths, and your leader will doubtless have his favourite route to follow. Day 7 - Trek to Bambarakanda Falls - 4 hours. Drive to Bandarawela. The atmosphere of today's walk is very different, as you descend through spectacular mountain scenery and past several small waterfalls (there will almost certainly be a chance for a natural shower) to reach dramatic Bambarakanda Falls. These falls, with a total drop of 260m/853ft, are the highest in Sri Lanka. After finishing the trek you will drive to Bandarawela. Day 8 - Drive to start of trek. Walk to temple - 4 hours. After an early breakfast at the hotel, you will drive to start today's walk which is through a mixture of natural forest and paddy fields. There will be plenty of opportunity to take photographs and see local people in this more populated area. The walk culminates in a village and the night will be spent in the Bogoda Buddhist temple (although tents can be provided for those who prefer a little more privacy). Day 9 - End trek. Drive to Dickoya - 3 hours. Late evening optional ascent of Adam's Peak, 2,243m/7,359ft. After ending your trek you will be met by your vehicle, and driven through the hills to Dickoya. There will be time to settle in to the hotel and have dinner before setting off to ascend Adam's Peak, 2,243m/7,400ft, to watch the sun rise. Although not quite the island's highest point, Adam's Peak is its most famous and held sacred by Buddhists, Hindus and Muslims alike. Atop the peak, now covered by a shrine, is reported to be the footprint in the rock which, depending upon your faith is believed to be that of Buddha, Adam or Shiva. The peak is a major pilgrimage site and in the season many hundreds of people climb through the night to watch sunrise from the summit. Setting out from the base of the mountain at Dalhousie at around 2-2.30am, it takes between 2½-4 hours to cover the 7km/4½ miles and 5,200 stone steps, to reach the summit. Along the way you will pass a multitude of refreshment and souvenir stalls and the occasional rest area, all amongst the hubbub of monks, pilgrims and entire families making the climb. Watching the sunrise, and feeling its warming rays as they reach you, is certainly a memorable reward for one of the more unusual mountain walks you are likely to make. Day 10 - Return to accommodation. Rest of day at leisure. Having walked back down the mountain you then make the return drive to the hotel. The rest of the day is yours to rest and relax. Dickoya is in the heart of Sri Lanka's tea country, and you can go for a gentle wander amongst the tea, or simply relax at your accommodation. Day 11 - Drive to Uda Walawe - 4 hours. Game drive. You will leave the hill country today and make the scenic journey south towards the coast. After descending from the hills you'll arrive at Uda Walawe National Park, where you will have a Jeep Safari through the park. You are now in the dry zone, a lowland area of evergreen forests which in contrast to the ubiquitous rain forest, is one the few dry forest areas in the whole Indo-Pacific region. Combined with the surrounding areas of thorny scrubland this environment supports a healthy population of elephants and over 70 other species of mammal. You will also have the chance to visit the elephant transit home. Day 12 - Drive to Waikkal - 5 hours. Rest of day at leisure. Today you drive to the west coast to Waikkal. Just outside the village, and set between the sea, a lagoon and 2 rivers, lies the unique Ranweli Hotel. The final part of your journey to the hotel will be by passenger ferry. Day 13 - Local walk and boat ride. Today will be taken at a leisurely pace. As well as time to relax by the pool, or on the beach, you can enjoy a two hour guided walk through the mangrove swamps and on a boat trip around the lagoons. There is plenty to see here; the area is home to 130 species of birds some of which you may be able to spot and nine species of amphibians, not to mention the Water Monitor Lizard. Day 14 - Group transfer to the airport. Fly to London. After breakfast you will be transferred to the airport for your flight to London. The whole experience was the type of trip we were looking for to gain an insight into rural Sri Lanka away from the tourist areas with a particular emphasis on pristine scenery, fauna and flora and the opportunity to meet local and varied villagers. The accommodation was interesting and exciting, we always selected the local food and were never disappointed by random service stations for lunch to top of the range hotels. Every Sri Lankan we encountered couldn't have been more welcoming. A particular mention should go to Hafeel our young trekking guide whose friendly nature has rewarded him with a wealth of contacts along the way. 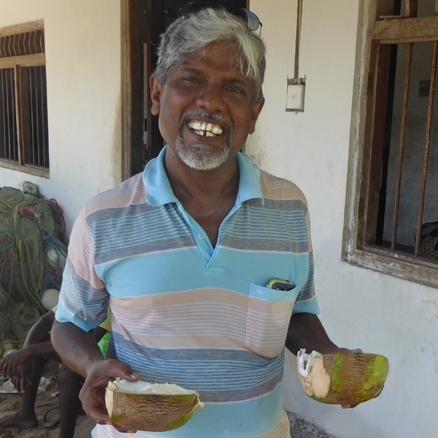 He was able to give us an insight into the homes of Tamil tea pickers, paddy field workers..... over many cups of tea. His experienced eyes spotted so many birds and other animals and countless interesting plants.